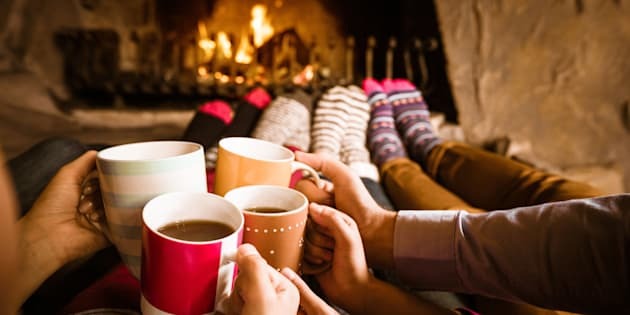 Four people warming their feet by the fireplace and drinking hot chocolate. It’s that time of year again. The time when the weather cools, the twinkle lights come out and everyone is feeling a little bit festive. Even you. And because of all that, you have an itch to throw a holiday party. There’s just one problem: you’re an introvert through and through. It’s not that introverts can’t throw an awesome holiday party ― of course we can ― it’s just that the task, no matter how much an introvert might want to do it, is entirely daunting. And then there’s the important matter of making sure that one has fun at their own gathering. This can be harder than it seems. We’re here to help, with a handful of tips that’ll guide any introvert through hosting their own holiday party. Here are some things to keep in mind as you delve into the (probably) unfamiliar hosting terrain. And just so you know, we’re speaking from personal experience. 1. Only invite as many people as you can handle at once. Seriously, even just a handful of friends makes for a great soiree. Just because it’s a party doesn’t mean your home has to be overflowing with people. Don’t feel like you have to give in to big guest lists. 2. Make sure you specify an end time. No matter how much you might love the people at your holiday party, at a certain point most introverts just get tired of socializing. While it’s possible that not everyone will be mindful of your party’s end time, the folks who do pay attention to that kind of thing will start filing out at that time, which will encourage others to do the same. This is a godsend. 3. Be sure to plan quiet time before AND after the party. This is crucial. Many introverts need to recharge after social situations, so make sure you do so before the party ― so that you’re prepared for all the social interactions about to take place ― and after to recoup from the experience. 4. Don’t feel bad if you need to take a small break. Take an extra-long trip to the bathroom or escape to your room for a few minutes. Sometimes that’s enough to help an introvert get through the rest of the night. No one will notice. 5. Make it low key. Don’t go overboard with plans. Just because socializing isn’t your thing doesn’t mean that you have to prepare the evening with lots of activities to keep your guests occupied. Trust that the evening will flow on its own. 6. Keep busy. If awkward pauses are the thing you dread, you’re in luck because as the host you have so many excuses ― filling drinks, clearing plates, etc. ― to break away from a conversation to attend to things. This is one main reason that hosting a party is better than attending one. 7. Have a go-to person. If your sister is a serious extrovert or if your best friend is great at chit chat, ask them to help you host. It can be easier ― and more fun ― to tag team parties. 8. Remember, it’s YOUR party. It can be whatever you want it to be. Sure, images of crowded apartments, overflowing food and drink tables and loud music are what we think of when we think holiday party, but that’s just one kind of shindig. Since you are the one throwing this party, you’re free the make it the kind of event you want to attend ― and stay at. Even if that means just a few people sitting around a fire drinking hot cocoa and eating holiday cookies. 9. Have fun. It’ll be over before you know it.